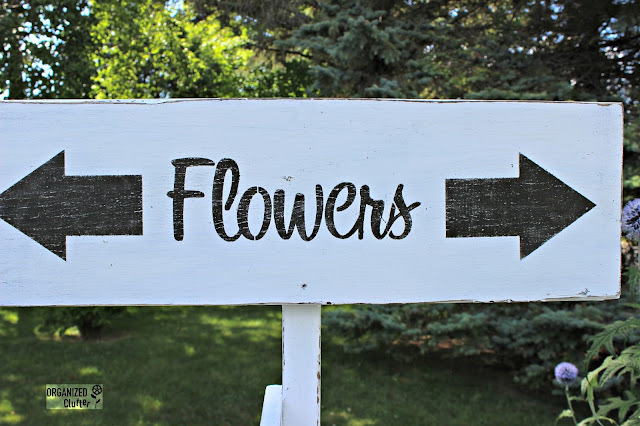 I just finished stenciling the second directional sign I purchased last weekend at the local occasional shop sale. Here the signs were last weekend. Base coated in brown paint but not decorated or stenciled. Here is directional sign #1. I am using an old plastic tablecloth for a painting drop cloth! 1. Top sign 7" x 24" x 1" board. 2. 1" square board for signpost. 3. 8 - 13 1/2" x 2 5/16" pickets. 4. 4 - 2" x 4" x 16" boards for the base. I painted this sign with Painter's Touch white flat paint, and stenciled it with *Old Sign Stencils Market Extensions. 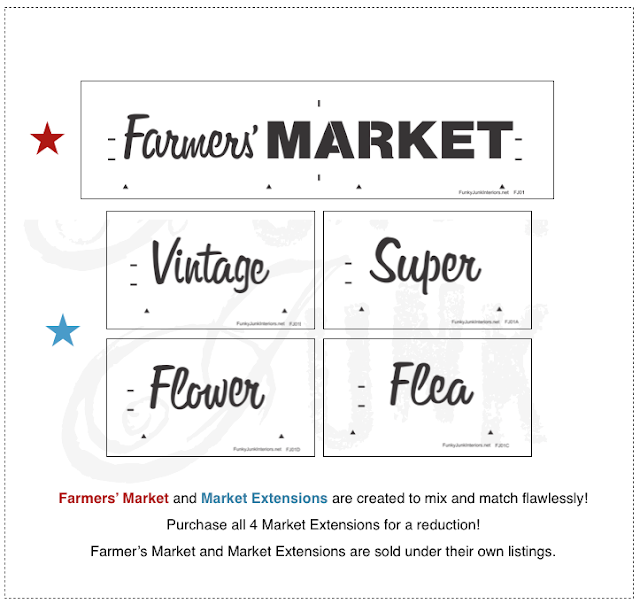 Since the flower stencil didn't have an "S" at the end, I lined up the "Farmers" stencil and added the "S". The arrow is from the Getaway Collection. 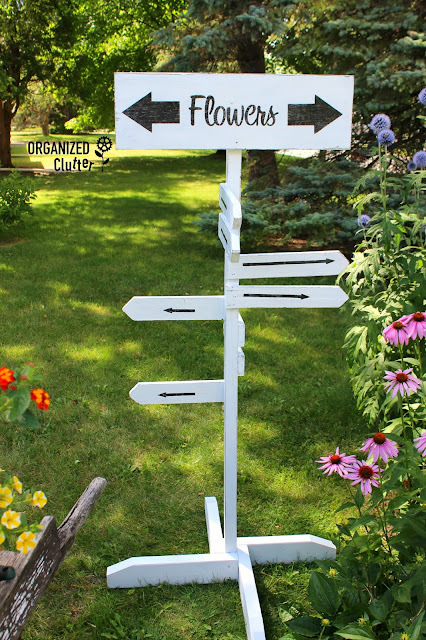 Since the directional arrows were quite narrow, hardly any of my stencils worked, so I decided it may be fun to make them all arrows pointing to FLOWERS in my yard. I think it's quite fitting! I used the arrow from the DecoArt Andy Skinner Mixed Media Stencil above. I just stenciled the back of each arrow and slid the stencil over and kept doing that until the arrow was as long as I wanted it. Then I added the arrows. They are all different lengths. I stenciled with black craft paint and a bristle brush. I lightly sanded the sign and edges with both 220 and 100 grit sandpaper, and lastly brushed on Polycrylic matte sealer to protect my sign from the elements. Where are the flowers? Everywhere! As always, another amazing project! 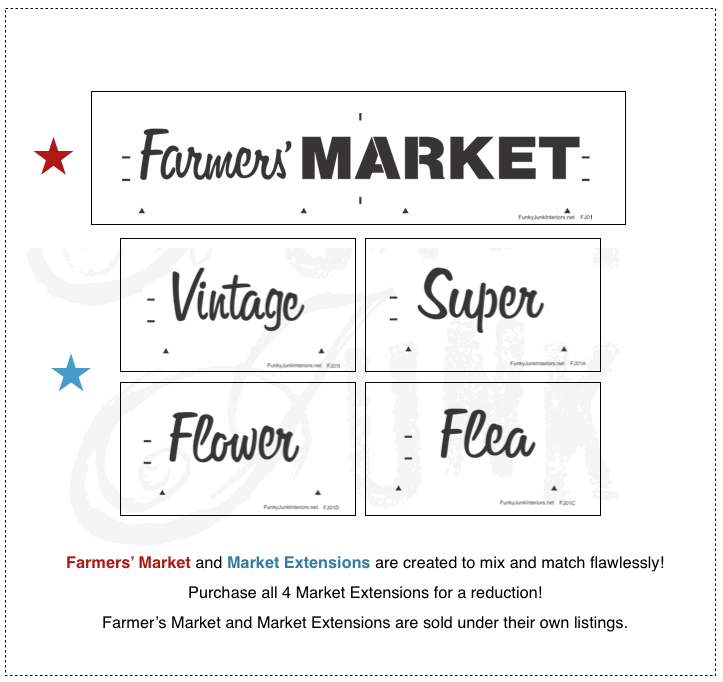 I really want to try to do some stenciling very soon. Yours are so nicely done! Thanks. I was excited to see this project because I've been planning something similar. We have 3 sons who live in 3 different states with their growing families. I stenciled their names on an arrow with the driving miles to their houses. 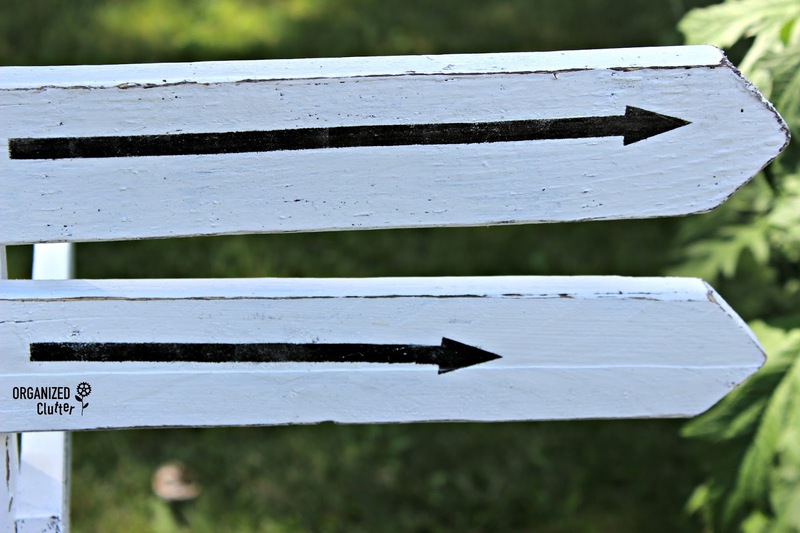 (Think of the sign on M*A*S*H) We've set up the post and are ready to point the arrows in the directions to their homes. This post has been most helpful. Very cute, Carlene! 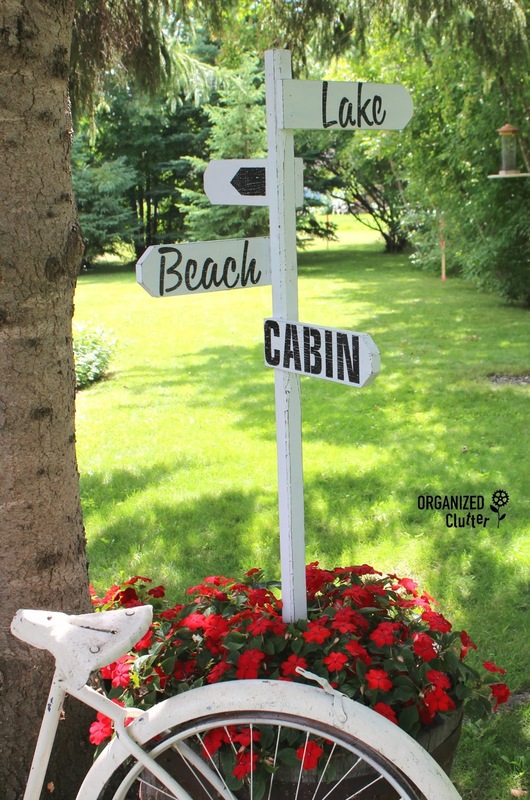 I bought a wooden Welcome sign recently with a sunflower on the top of the post and the welcome sign on a small board nailed on the post below the sunflower. I am still deciding what I want to do to it to fix it up. The post is kind of a grass green and the sunflower yellow, of course. I think I want to paint the post something else and use a darker yellow-orange for the sunflower and glue some dark beads or seeds in the center to represent the sunflower seeds. The welcome sign, I don't know yet. Anyway, thanks for showing what you did with the directional flower signs in your yard. They are a great idea! Amazing DIY! I love the concept! 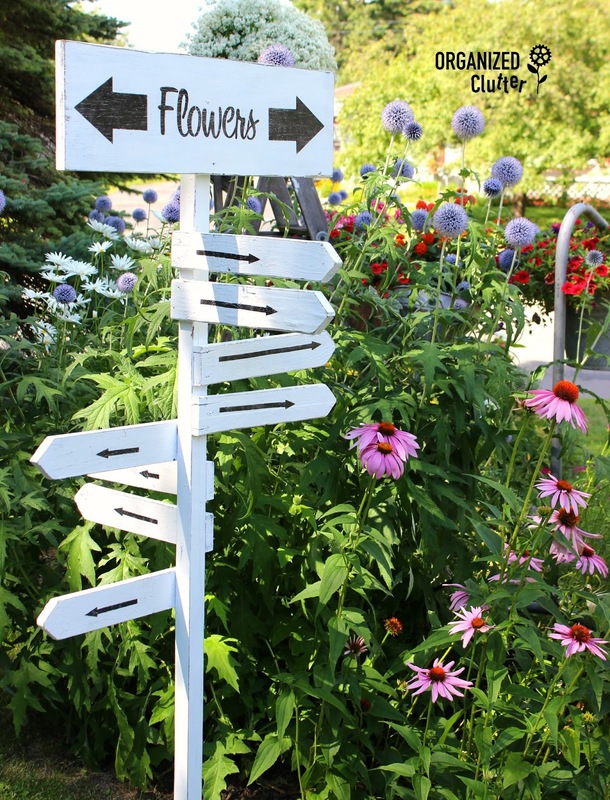 You are so right, flowers are everywhere!